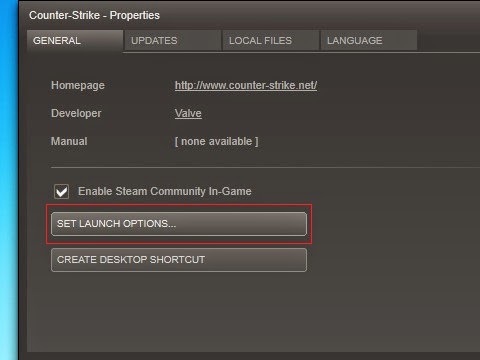 While in Steam, select Counter-Strike , then right click “Properties” as shown in the picture below. 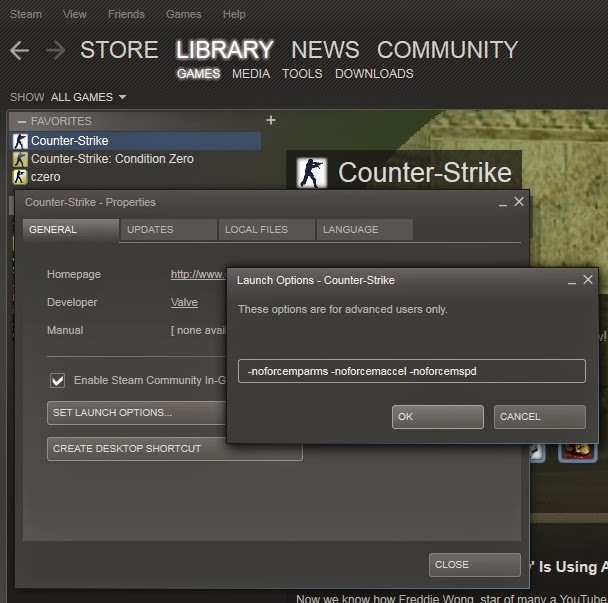 From here you can enter in a variety of launch options for Counter-Strike. Here is the list of launch options with their in-game usage. -noforcemspd : Use desktop mouse speed settings. -noforcemparms : Use desktop mouse buttons settings. -noaafonts : Disables Anti-Aliasing of Screen Fonts. -full : Forces the engine to start in fullscreen mode. -window : Forces the engine to start in windowed mode. -soft : This enables Software hardware rendering mode. -d3d : This enables Direct3D hardware rendering mode. -gl : This enables Open GL hardware rendering mode. -nojoy : Remove joystick support, more ram free. -noipx : Disables LAN protocol. -noip : Some IP related command remove if unable to connect to servers. -32bpp : Enables 32Bit rendering. -16bpp : Enables 16Bit rendering. -port 27015 : Changes your port # for the game. -console : When launching Half-Life, this will take you straight to the console. -dev : This is for developer mode. -zone # : This allocates more memory to scripting files, like autoexec.cfg and so forth. -game [mod's name]: Enable Half-Life to play modification games other than to go through the menu to select them. -safe : It start the game in safe mode disable audio etc. -autoconfig : Restores video and performance settings to default for the current hardware detected. -condebug : Logs all console output into the console.log text file. -nocrashdialog : Suppresses some 'memory could not be read' unhandled errors. -novid : When loading a game with this parameter, the intro Valve video will not play. -toconsole : Starts the engine directly in the console, unless a map is specified with +map. +a +r_mmx 1 : Instead of using a cfg you can launch the game with a command or a cvar in the command line.